Dalton, GA -- With one day to go before the opening day ceremonies, Bluegrass Bands Helping Hands organizers Paul Byrum and Tom Brown meet with musician Earl Brackin and Miracle Field Co-Director Millie Hicks to view the newly constructed Miracle Field. "Wow, it's simply awesome" says Millie Hicks. "I can't believe how beautiful everything is. 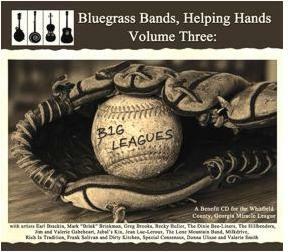 We really appreciate the support of Bluegrass Bands Helping Hands". Dalton's Miracle Field is a specialized baseball park which aims to serve children and adults with special needs in North Georgia and Chattanooga, Tennessee. Dalton, Georgia -- Bluegrass Bands Helping Hands is pleased to share that after receiving an anonymous gift of $65,000 The Miracle League of Whitfield County Georgia has reached their fundraising goal of $350,000. The funds will be used to finish construction of The Miracle Field, a specialized baseball park serving children and adults with special needs in North Georgia and Chattanooga, Tennessee.